Obituary – Chilcoat, Charles Neil « Perry High School Alumni Association, Inc.
﻿Charles Neil Chilcoat died March 28, 2005 at his home due to Emphysema complications. He was born to Cecil and Betty Jackson-Chilcoat on August 22, 1954 in Forsythe, Montana. 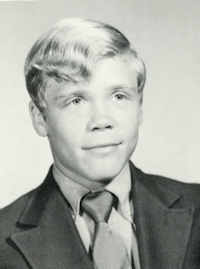 After graduating Perry High School in 1972, he joined the Navy where he served on the USS Bigelow from 1972-1976, specializing in electronics. He is survived by a daughter, Charlene Krugg, Colorado Springs, CO; a step-son James Hill, Lawton, OK and grandson, Uriah Krugg, Colorado Springs, CO; his mother, Betty Jackson-Chilcoat, Tulsa, OK; his sister and brother in law, Janet and Bruce Haley, Sand Springs, OK and brother Karl Chilcoat, Tulsa, OK; three nieces, Lori and Marcus Bandi, Tulsa, OK, Andrea and Bill Hayworth, Sand Springs, OK, and Crystal and Kevin Gilbreath, Perry, OK; a nephew Zach Morgan, Phoenix, AZ; one great niece, Brailey Gilbreath, Perry, OK and two great nephews, Cannon Gilbreath, Perry, OK and Alex Hayworth, Sand Springs, OK. He was preceded in death by his dad, Cecil Chilcoat and brother, Kent Chilcoat. A private, military graveside service was held Saturday, April 2, 2005 at 2 p.m. at Saint Rose of Lima Catholic Cemetery.